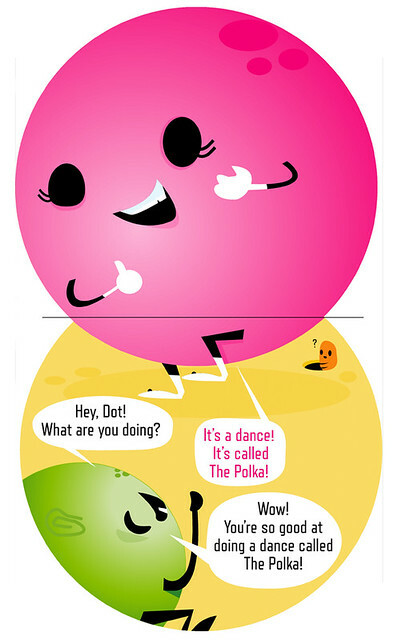 The Polka Dots: Learn To Polka! 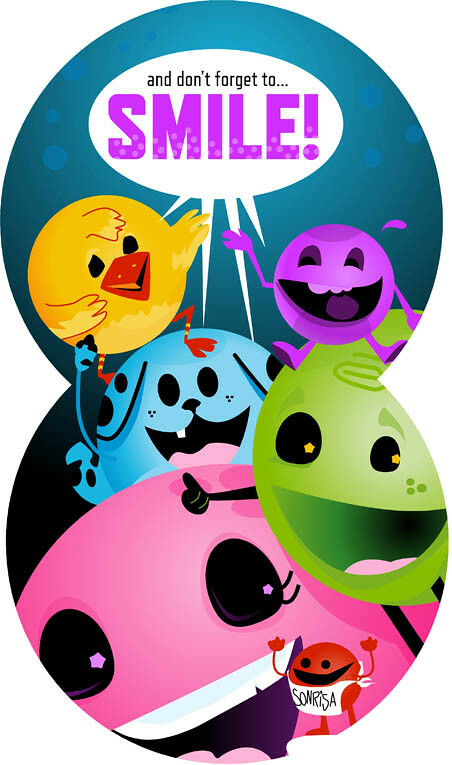 Help me publish a hilariously silly board book about a Polka Dot trying something new with the help of his friends! 67 backers pledged $5,137 to help bring this project to life. Help me publish a ridiculously silly book that's shaped like a Polka Dot! 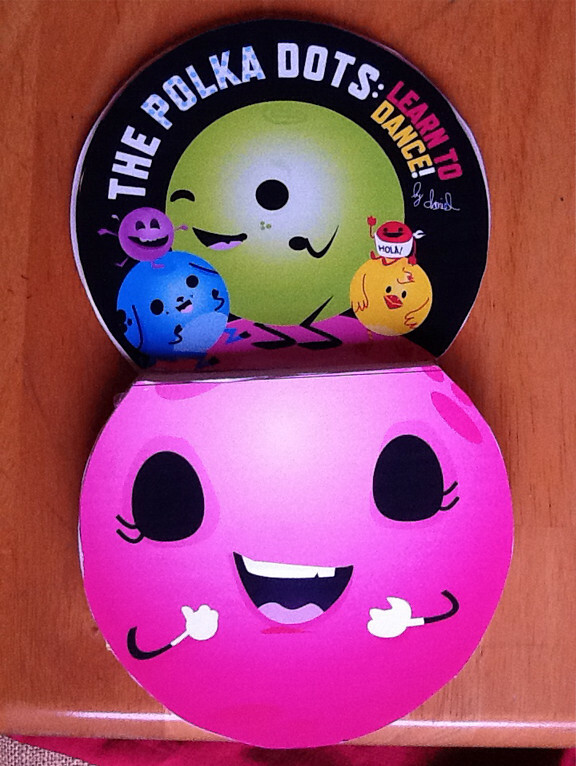 IT's ABOUT: a little green Polka Dot who learns how to do the Polka, with the help of his friends! THE POLKA DOTS: LEARN TO POLKA! 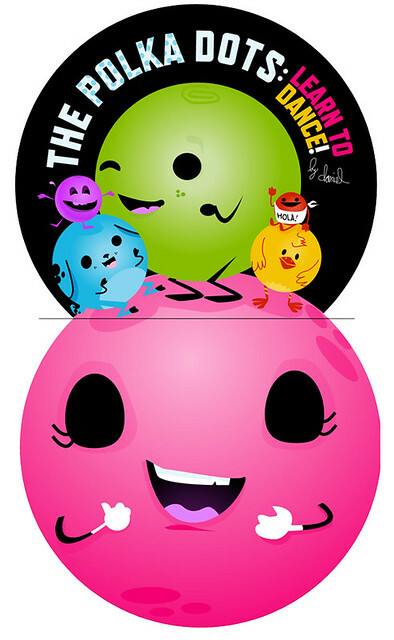 is a full color 26 page board (thick and friendly) book and it's fittingly SHAPED LIKE A POLKA DOT! People will love the optimistic-ly off beat happy story about how it can be difficult to do new things. People (who happen to be children) who are 2-4 years old, will especially love the story's bright contrasting colors and interactivity, as they, too, learn how to do a silly dance which we will call The Polka! I am dedicating this special book to my Grandpaw Buzz, who at 89 years old, still inspires me (and any one who comes into contact with him) to laugh and be ridiculous daily. The book is about 90% complete; it just needs some fine tuning and copy editing to go to press. Oh, and the all important funds for printing and shipping! 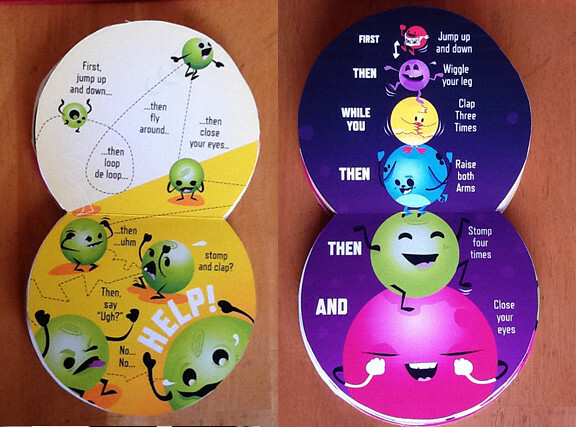 Take a look at the fun support levels and help make the first printing of this independently produced book happen. 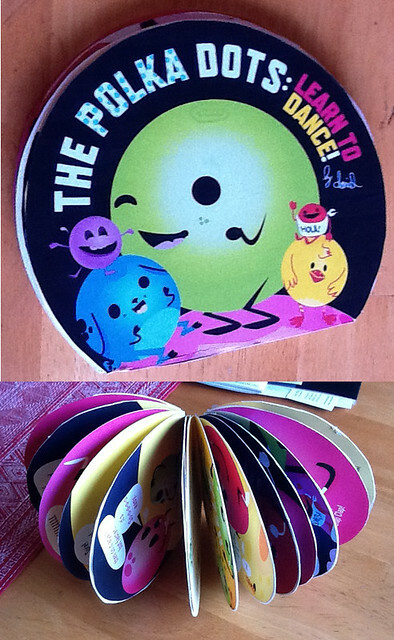 Here are a few mock-ups of the book! A .pdf of the Book, perfect for IPads and guilt ridden folks who happen to be allergic to paper. The Polka Dots: Learn to Polka board Book! A signed copy of the first printing of the book, shipping included to anywhere in the US! Plus a .pdf of the book. Add $4 for Canada. Add $6 for Internationals. shipping included to anywhere one location in the US. BOOK AND PRINT! The Polka Dots: Learn to Polka book and a 8x10" or larger framable print, both signed and shipped to US locations only. both signed by the author & shipped to anywhere in the U.S.
ALL signed by the author & shipped to anywhere in the U.S.
11" x 22" "GirlParts" Print (See Image to the Left). signed and Numbered AND the Polka Dots Book. Print sent in April, Book Sent in July. To US Residents ONLY. This level intended for retailers. Sent to your store located in the US. Shipping included. Retailers or educators only please. "FUNGUS INK DRAWING": a 12" x 12" Ink Drawing similar to the one shown on the left, plus the Polka Dots Book, shipped to anywhere in the US! 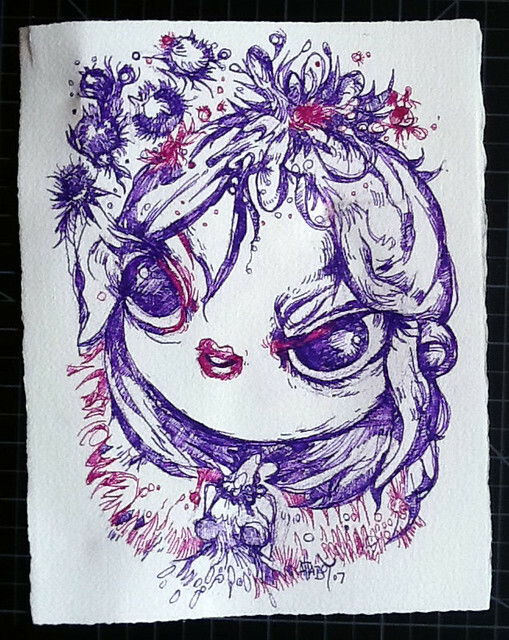 (see image on left) ORIGINAL ART by Attaboy OPTION E: "BLOSSOM": Aprox 8"x 10 1/4" ink drawing on water color paper and the New Book. Art Sent in April, Book Sent in July. US Shipping Only. You're a lover of the unknown,the unexpected, and the awesome. You know when to hold 'em and you want a surprise box form the author that's well worth $100. 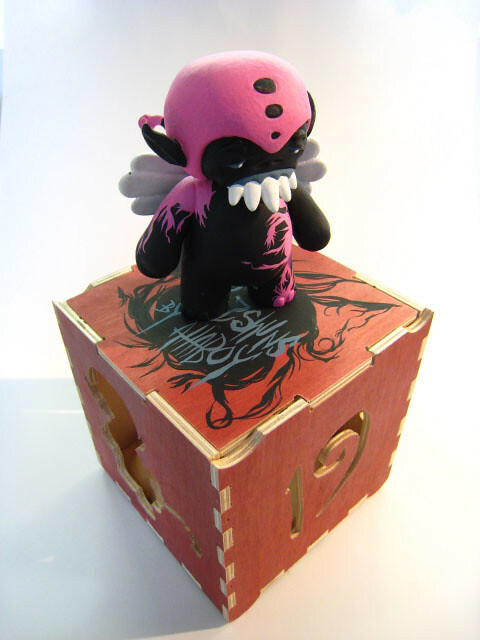 INCLUDES THE BOOK and special items that will make the day that you receive the package one to remember (might be filled with limited toys limited toys, original sketches, unreleased/sold out items). It will be a mysterious combination of items that will make your pee turn yellow! Only 25 of these will be made. 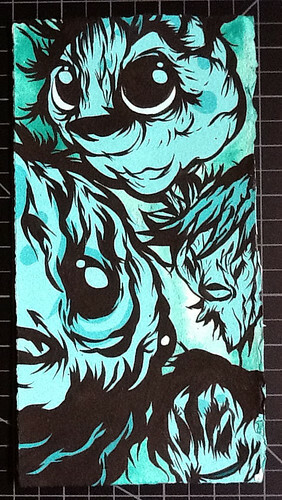 (see image on left) ORIGINAL ART by Attaboy OPTION B: "DENIZEN": Aprox 5 1/2"x 6 3/4" painting and the New Book. Art Sent in April, Book Sent in July. US Shipping Only. 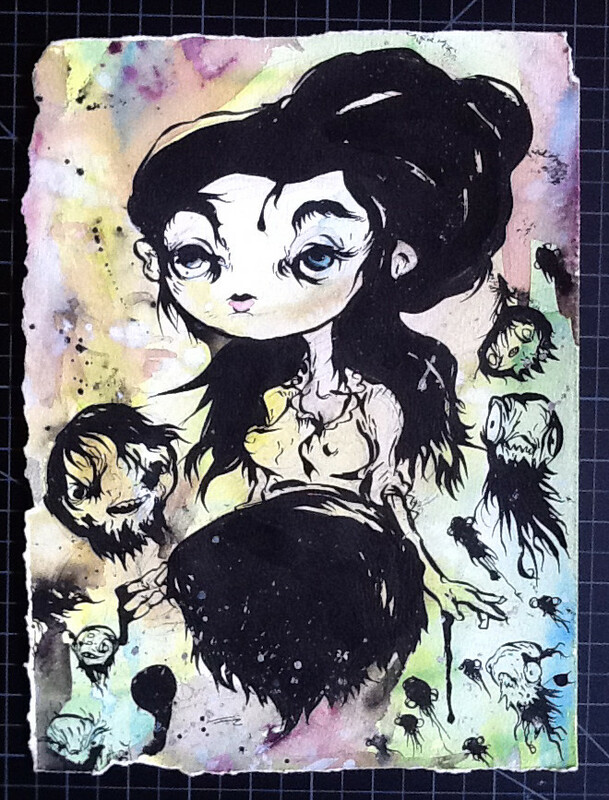 (see image on left) ORIGINAL ART by Attaboy OPTION A: "BRINE QUEEN": Aprox 9x12" Ink wash drawing and the New Book. Art Sent in April, Book Sent in July. US Shipping Only. 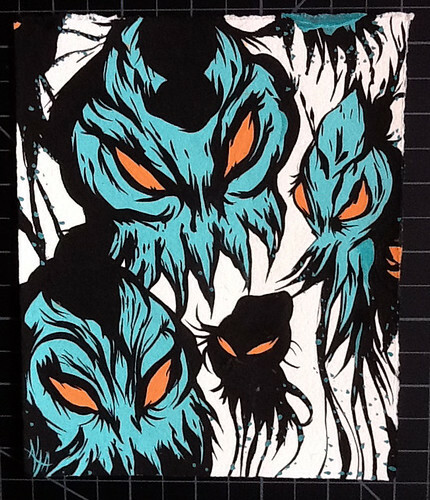 (see image on left) ORIGINAL ART by Attaboy OPTION C: "MULOSK BRINE": Aprox 4 3/4"x 9 1/2" painting and the New Book. Art Sent in April, Book Sent in July. US Shipping Only. 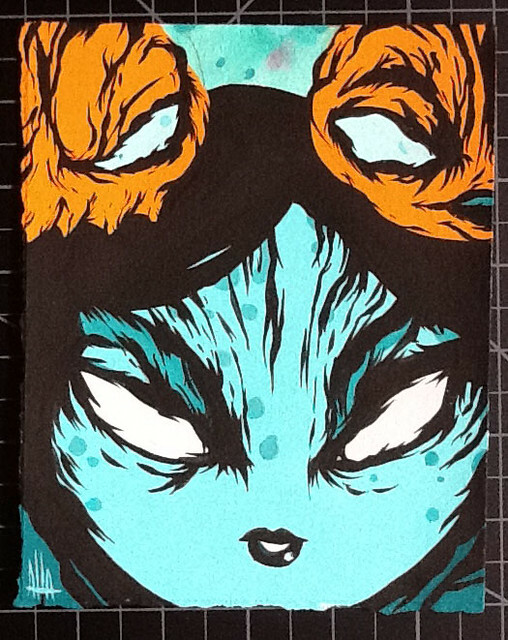 (see image on left) ORIGINAL ART by Attaboy OPTION D: "THE INTRODUCTION": Aprox 5 1/2"x 6 3/4" painting and the New Book. Art Sent in April, Book Sent in July. US Shipping Only. 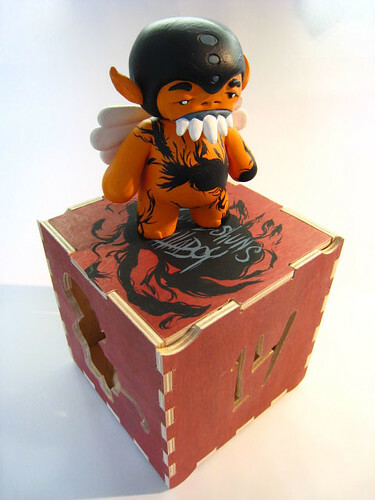 Includes Winged Qwezshun Figure and hand painted, uniquely numbered box (box made by Because We Can), certificate, & stand (not seen in photo), Shipped to US residents only! Figure Shipped in April And the BOOK shipped in July. at a SPECIAL READING/signing by the author at your class, store, group, gallery, or very own polka party. Author will draw in attendees' books and host a Q & A with kids or adults. To be scheduled as part of author's West Coast Tour this Fall. CA, OR, and WA coast locations, only please. "MERCURY REV" Amazing Original Art Piece (See Image on the Left! ): beautifully framed and matted Attaboy Original 24" x 34" color pencil drawing. shipped to US resident. As seen in Attaboy's "A Touch of Evil Show"
Also Includes the New Polka Dots: Learn To Dance Book. 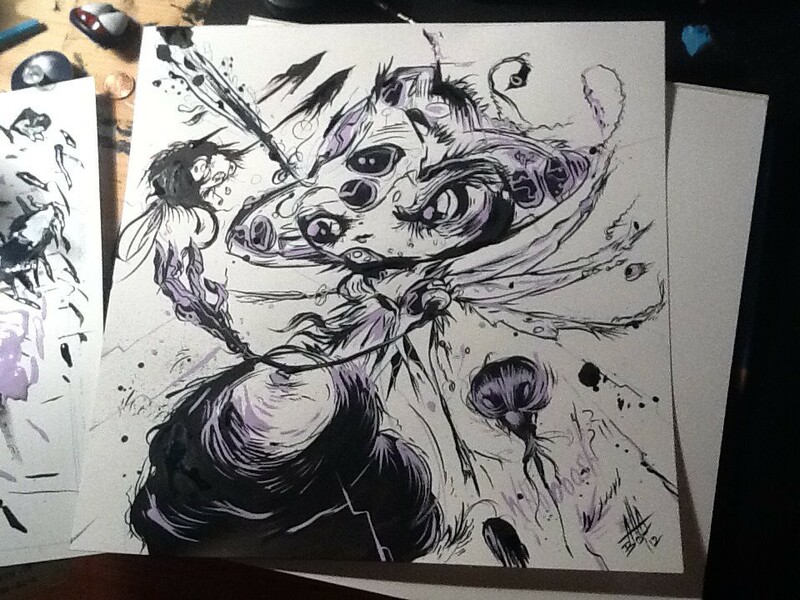 Art Will be shipped by April 1st, Book Shipped In July. Lookout!